Obama Offers Trade for U.S. Marine Sgt. Andrew Tahmooressi Still Being Held in Squalid Mexican Jail-- Obama Offers Priceless Selfie Poster to Mexican President Peña Nieto in Exchange for St. Tahmooressi. President Obama called an emergency meeting with Mexican President Peña Nieto to propose a trade for Marine Sgt. 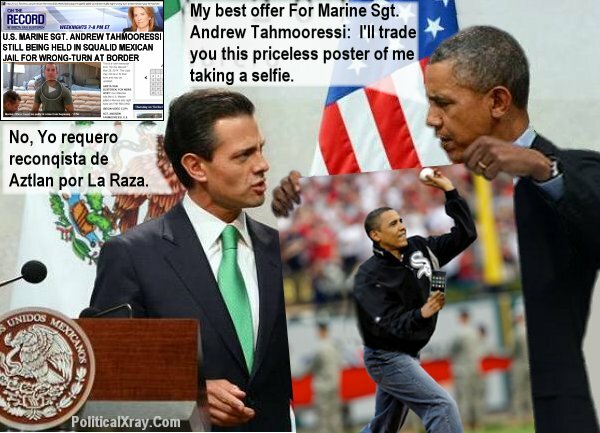 Andrew Tahmooressi: Obama said to Nieto: "Here's my best offer: I'll trade you this priceless poster of me taking a selfie for Marine Sgt. Andrew Tahmooressi you're holding in a squalid Mexican jail for having unintentionally entered Mexico as a result of being trapped by road-work barriers and confusing and contradictory road signage." Nieto replied to Obama: "No, Yo requero reconqista de Aztlan por La Raza."